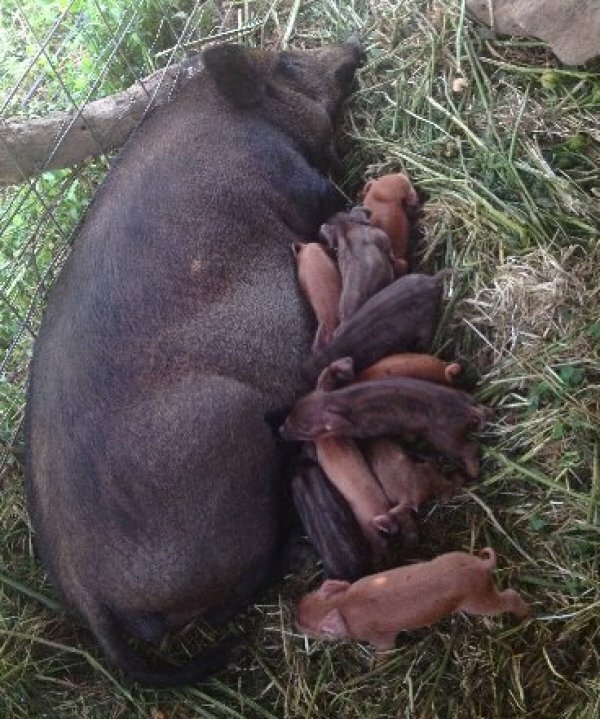 Summertime is piglet time, and here’s Matilda with her day-old babies. Matilda is a Red Wattle cross with a little bit of Wild Hog blood. Her babies usually have the hangy-down wattles of a Red Wattle, but they often have Wild Hog stripes or spots, too. They make a multicolor batch of babies! You can see the greenery that she’s laying in—on the morning her babies are due she carefully cuts great bunches of tall weeds. She carries them in her mouth and makes a beautiful, huge nest where she’ll have her babies.